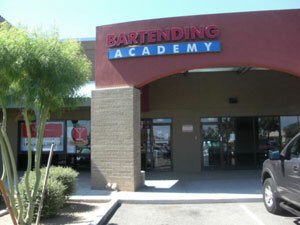 ARIZONA BARTENDING ACADEMY - OUR STUDENTS END UP BEHIND BARS! For years we have proudly boasted that our bartending students end up behind bars and they love every minute of it. How many people do you know that can claim that they actually look forward to going to work every day and have fun at the same time? Not only do our bartending graduates enjoy their work, but they also reap the fringe benefits that accompany our profession, including great pay, a fun and exciting work environment, and an industry that has been referred to as recession proof. The Bartending Academy of Tempe is located adjacent to the Arizona State University's main campus at 1250 E. Apache Blvd., Suite 108. We are here to help you change your career, or help you supplement your income. Click here to checkout our Tempe School You Tube video! "COME VISIT US AND SEE THE DIFFERENCE"